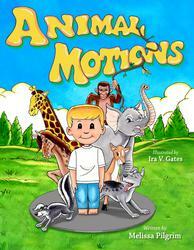 Today’s book review is for Animal Motions, written by Melissa Pilgrim, illustrated by Ira V. Graves, published by Indigo River Publishing. I received a copy of this book from the author, through the First Reads giveaway program on Goodreads, with the understanding that I would provide an honest review. Animal Motions is a book designed to teach children an easy, low-impact movement routine, while at the same time encouraging them to use their imaginations. It was developed from a theater exercise that author, Melissa Pilgrim, used when she worked with kids at a theater in Chicago. Easy to execute in small spaces, children are asked to follow along with a boy named Eric as he pretends to be 17 different animals. By connecting each stretch and movement with animals, children will be able to easily remember how to perform each stretch and movement. Pilgrim’s first person prose, told from the point of view of little boy Eric, does the job of leading children through the routine. However, sometimes the phrasing that she used felt a little awkward to me–particularly when considering her target audience. The first thing that threw me was the use of the word “mimicking;” while I have no problem with exposing children to new vocabulary, it seems that doing so in the context of a movement exercise might not be the optimal approach. Because the book was adapted from a theater exercise, the book was full of run-on sentences. They’re a natural part of spoken language, but on the page they can be distracting. My biggest issue, though, was with Gates’s illustrations. Determining the quality of illustration, as with any art form, is a highly subjective matter. That said, I found the illustrations in this book really tacky. So tacky, in fact, that I had to re-read the book a few times to overcome the negative impression they gave me. They reminded me of the low-budget freebie books I got as a child in the 1980s. The cheesy expressions on the animals and the incredibly dated image of the family at the end were bad, but the worst part were the garish and excessive yellow highlights used throughout. There were some nice ideas behind the illustrations, but the execution left so much to be desired. The book does, however, still have educational merit, which is why I ultimately gave it 3 out of 5 stars. 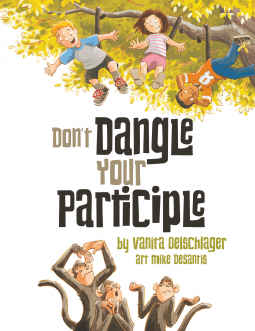 As a picture book, I’d rate it lower–but I decided to instead evaluate it as an educational resource. And on that front, it does a great job. Parents and teachers who purchase the book are directed to the book’s website: animalmotions.com, where there are 6 free lesson plans available. The lesson plans are targeted to children ages 3-6 and cover subject areas of health & fitness, drama, and combined biology & geography. There is also a mini-poster that can be printed out for children to cover. It could be utilized in classrooms, camps, daycares or home-school environments.